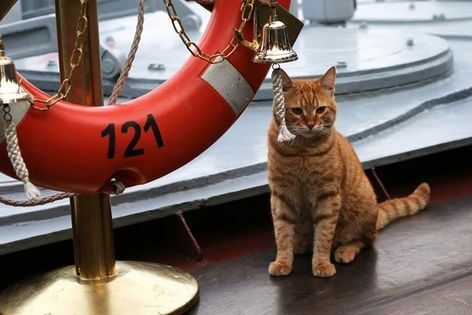 A nameless orange tabby is the first cat to make the long trip to the Syrian coast on a Russian naval ship, according to Russia’s Ministry of Defense. Cats have been serving aboard Russian ships for hundreds of years, becoming full-fledged members of the crew, in order to keep the mice at bay. They also keep the sailor’s company on these long journeys. Internet users have been speculating on a name for this naval puss, and even suggesting that the kitty be given a rank. This orange tabby isn’t the only working cat in Russia. Botsman (“Botswain”) is another working cat serving on a nuclear-powered cruiser in the Russian Fleet. River cruise ships also “employ” cats. Two cats serve on the Vodokhod river cruiser, one called Botsman (a popular “ship kitty” name, evidently), and his assistant Matros (“deckhand”). Cats are also employed as mousers in both The Hermitage Museum in St. Petersburg and Serpukhov’s Museum of History and Art in Moscow. Can you suggest a name for this Russian naval kitty? Trump! ha! It’s the perfect name, really. expert mouser is a highly skilled profession! this orange sailor has a better chance at employment than me.